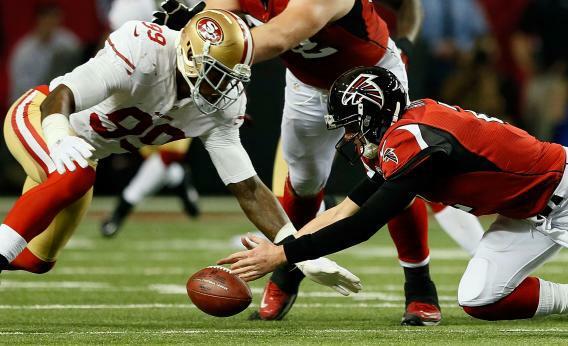 ATLANTA, GA - JANUARY 20: Quarterback Matt Ryan #2 of the Atlanta Falcons fumbles the ball and is recovered by outside linebacker Aldon Smith #99 of the San Francisco 49ers in the third quarter in the NFC Championship game at the Georgia Dome on January 20, 2013 in Atlanta, Georgia. It’s the first full day since the Senate passed watered-down rules reform. Breathe it in – feel that comity. If you want to be optimistic about Mary Jo White, here’s your evidence. Bobby Jindal gives yet another speech saying that the Republicans need to get specific about the good they can do for America, without getting terribly specific about these things. Florida’s Republican leadership wants no part of the Electoral College-rigging scheme. Florida, the largest swing state, won’t go along with changing the Electoral College if Florida House Speaker Will Weatherford has any say (and he has a major say). “To me, that’s like saying in a football game, ‘We should have only three quarters, because we were winning after three quarters and the beat us in the fourth,” Weatherford, a Republican, told the Herald/Times. The Virginia legislature keeps being awesome.